Wind chimes with Angels are the newest addition to my garden. Colored glass angel wind chimes belong in my garden for several reasons. I believe any garden art crafted with colored glass is perfect for any garden. Colored glass wind chimes reflect light in so many hues, angles and various degrees of sunlight. They also bring cheer to a sad winter garden. Colored glass paired with angel wind chimes is perfect in my mind for creative and colorful garden decor. I also added my angel wind chimes because my last name is Angell. I know that’s probably kind of corny, but I couldn’t resist anyway. My wind chime angel is the perfect color for my garden decor. The blues and slight greens of the glass wind chimes are a jewel tone that appeals to me very much. 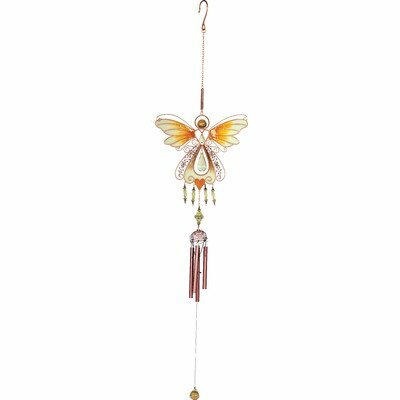 The little glass balls that adorn my angel wind chime are so pretty and fitting for an angel 🙂 I also love the bronze colored metal used in creating this chime. Hanging my wind chime angel was super easy. I mounted a plant hanger to my fence and that was it! I put the chime in a sheltered area that doesn’t catch much wind to prevent breakage in case the weather gets wild. I am certain anyone decorating their garden with a “sanctuary” in mind will agree that wind chimes with angels are a natural fit. Angel’s embody a spirit of peace and tranquility that naturally fits in to almost any garden decor theme. 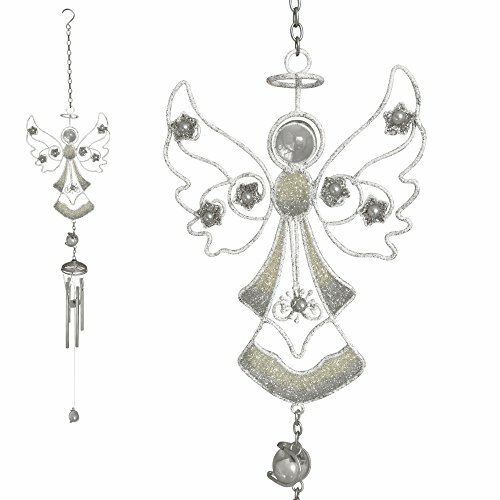 The actual chimes on my angel wind chime are small so the “music” created is kind of a soft tinkle. Sometimes this is over powered by my large tube wind chimes. That’s okay though, because my glass angel wind chimes are prettier. And more colorful. Just saying. 🙂 They each play an important role in completing my special garden space. Additionally, in my mind they don’t compete, but instead compliment each other in the wind chime department. One Angel Wind Chime or Many? 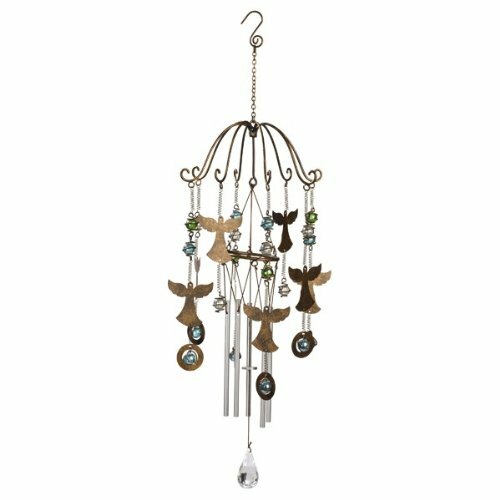 Since Angels themselves are so symbolic, wind chimes with angels are a natural addition to add to any garden. I have my one angel overseeing my tiny garden. This gives her top angel status if you will. What I mean here is, in the spirit of creative garden decor, one well positioned anything (an angel in this case) goes a long way. Individual items of garden decor mixed with other pieces work together to synergistically create the ultimate spirit of a garden. Conversely a themed garden full of angels is a great option as well if that suits your taste and is what you desire for your garden decor. 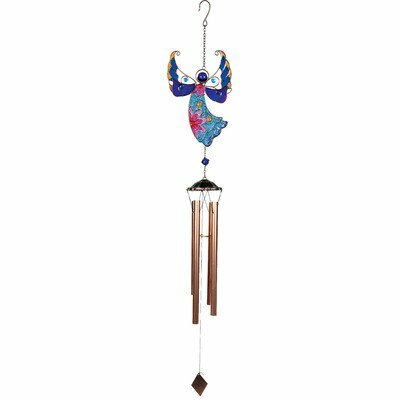 I imagine a garden full of tinkling, beautiful angel wind chimes would create a heavenly space to relax and feel completely at peace. Especially if there were multiple colored glass angel wind chimes. How pretty! 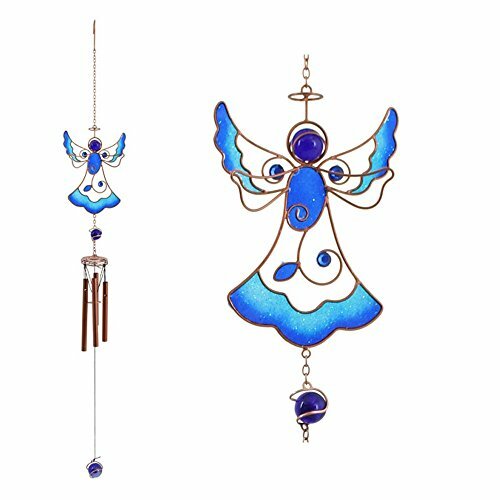 Colored Glass, Colored Glass Wind Chimes, Wind Chimes, wind chimes with angels.